Medieval or medium aevum in Latin for "Middle Ages" was between the decline of the Roman Empire and the Renaissance. 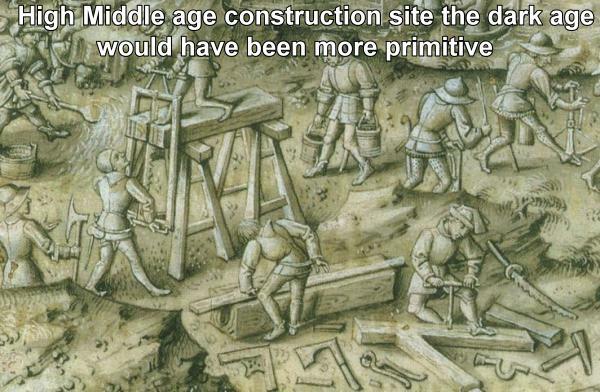 The 1000 year Medieval period had three basic ages Early, High and Late. The time this covers is the Early Middle age that began with the extinguishing of the light of Rome around 500 and lasts to 1000, often called the "Dark Age" since people were just trying to stay alive so very little information survived, leaving History in the dark. The High Middle Age from 1000 to 1300 produced the The Magna Carta in 1215 which is considered as the document that provided the foundations for English liberties, which were then extended to America and used as part of their own declaration of civil rights. The Late Middle from 1300 to 1500 with the fall of Byzantine Eastern Roman Empire to the Turks in 1453 again sees famine, plague and war. The bridge we call the middle ages was full of romantic tales of knights and castles, brutal torture, chaos and epidemics like the Black Death, the beginning of higher education for all people. Perhaps a golden age for carpenters with the intensive training in the guilds and master carpenters being retained by king, nobles and church as craftsmen producing master pieces of timberwork and the finest of trim jointery on their castles churches and estates. Carpenters in Europe had to rebuild from the choas, produce sanctuaries for the populace and retain the carpentry trade as much as possible for the time. In the wake of the demise of the Roman Empire, peasants, nobles and clergyman had to literally remake their lives. The lack of security on the roads prevented most commerce so each town had to be almost self-sufficient, producing the necessary iron, wood, wool and wheat, and without commerce there can be no large cities. As the urban life of Rome gave way to the countryside, people became more closely attached to the land, their very survival depended upon it. These people needed security and protection from the roving hordes. The majority of towns were often founded near the fortifications the carpenters built for feudal lords, monasteries or the ruins of antique cities where they could have found existing building materials. In return the development of serfdom and feudalism promised security and protection, however, feudalism contained the seeds of its own destruction. What began as an attempt to restore social, political, military and economic order, ended up producing nothing less than anarchy. The breakdown was fast and dramatic. By the first 300 years carpentry technology and engineering advances were lost, education collapsed great libraries like at Alexandria burned and a rise of illiteracy among the leadership. In the early anarchy of the dark age you see the Roman cities like London abandoned, Rome seiged and sacked for it's riches. Warlords desimated safe trading and manufacturing in Europe. There was a period of rapid cooling, and with the loss of the Roman slave plantation system, farming yields declined to subsistance levels. The food shortages produced a migration of tribes into the Empire, which were hunting bands of clans descended from a common ancestor who felt that they were related by blood. The Justinian Plague of 541 wiped out 25 percent of the population, (before the even worse Black Death in 1347) and piles on even higher death tolls to the madness and destruction. It would have seemed like it was the end of the world. The people turn to religous fanaticism looking for a way out, perfect timing for the rise of Christianity but this does bring more good than bad in the high middle age. England was invaded in 500 by Jutes and Angles from what today is Denmark, and Saxons from northern Germany. By 600 most of the Anglo-Saxon kings were converted to Christianity. The kings were inclined to welcome a religion whose scriptures supported monarchy and in 669 the appointment of an archbishop over the whole of England and a larger role by the Church in state affairs. In 700 the Moors move into Spain. In 768 Charlemagne united Gaul with the Carolingian Empire a foundation for the brief rise of the Holy Roman Empire. A brief summary of the major waves of invasions. Angles, Saxons, Jutes and Frisians invaded England. This is the root of the term Anglo-Saxon, which is often used to describe English peoples. Arabs (Moors) and Saracens invaded from the south settling in Spain, Italy, Portugal and southern Gaul (France). Danes invaded England and settled in the northeast of the country. Goths, (East Germanic people) whom were called barbarians by the Romans, invaded Italy and Gaul. Hungarians occupied lands taken in the eastern Europe. Normans were the descendants of Vikings and their western European colonies, they invaded and captured England in 1066, eventually expanding to Italy, Sicily and the Holy Land. Vandals (southern Scandinavia) invaded Spain and Africa. The peoples eventually gather around the churches, warlord fortresses and into villages where the Roman carpentry guilds become even more important with the carpenters protecting the encampments and building what will turn into castles. Their knowlege, though much is lost, is handed down and coveted by King and country and the carpentry guilds eventually become even more powerful. Peasants were the poorest people in the medieval era and lived primarily in the country or small villages. Serfs were the poorest of the peasant class, and were a type of slave. Lords owned the serfs who lived on their lands. In exchange for a place to live, serfs worked the land to grow crops for themselves and their lord. In addition, serfs were expected to work the farms for the lord and pay rent. Farmers were a bit better off than peasants, as some owned their own farms. Most worked the farm lands themselves or with the aid of peasants and serfs. When the Germanic and Norse turn south they bring with them their tribal democracy and earliest known parliments. Raidng Norse factions, the Vikings, make a huge impact in our line of carpentry with most Norse (Northmen) Angles and Saxons assimilating and melding into the settlements with their craftsmanship and what is left of the Roman carpenter guilds. This though gives opportunity to the strong and the Church who convert many of the tribes which take advantage with serfdom and fuedalism. The collegia did survive in the east. The Book of the Prefect, a manual of government probably drawn up by the Byzantine emperor Leo VI in the year 900, provides a picture of an elaborate guild organization whose primary function was the imposition of rigid controls, especially for financial and tax-raising purposes, on every craft and trade. Eventually, though you have to admit not the best way to go about it, the death and destruction does give rise to the importance of the carpentry trades. 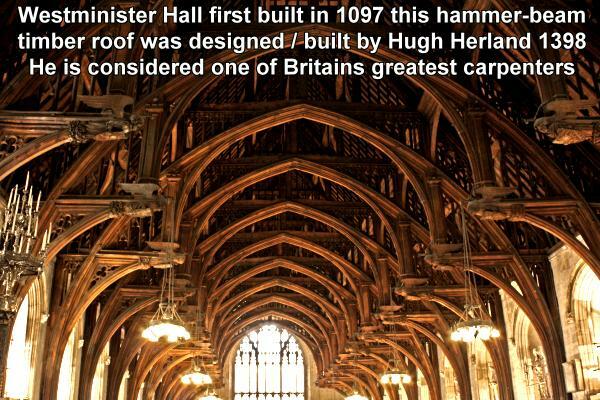 Perhaps even what could be considered the golden age of carpentry later in the era when you look at some of the fine craftsmanship of the master carpenters work on the castles, estates and the Romanesque Norman wooden stave churches built with post and beam construction, later in the High and Late Medieval ages. A little draw back was a master carpenter at that time could have been put to death if anything went wrong. Elite master carpenters were highly skilled tradesmen with the finest able to earn a decent wage always being in demand and sought after. Carpentry guilds became possible when towns began to stabilize and expand around 900 however proper organization of the guilds didn't occur until the 12th Century. They originated in order to promote fair competition with each other, guard their trade secrets as they were passed down to apprentices and in many cases to protect themselves from the merchant guilds. The carpenters would band together and agree on some basic rules governing for their trade which were generally alike throughout Europe. They would oversee the practices of their members and impose fines on those found in violation of the rules, poor workmanship or unfair competition and under certain circumstances even criminal jurisdiction. Most guilds would care of any member who fell sick, arrange burials if needed and take care of the widows and orphans of the less prosperous. The carpentry guilds supported their towns governments and charities often building schools and churches. They maintained guildhalls in which the membership could hold banquets and conduct official business to promote their own and the towns prosperity. The carpentry guilds were ranked according to status into masters, journeymen, and apprentices. The master carpenter took on apprentices they provided with food, clothing, shelter, and an education who in return were endentured and worked for him without payment. Carpentry apprenticeships were so highly valued that a family might have to pay a master a large sum of money to enroll their son but they eventually became restricted to only the sons or relatives of other masters. After completing a fixed term of service, five to nine years, an apprentice became a journeyman who could work for one or another master and was paid with wages for his labour. A journeyman who could provide proof of his technical competence (the "masterpiece") might rise in the guild to the status of a master whereupon he could set up his own workshop, but not on the same street as his master or take work if another shop was closer. The decline of artistic and architectural achievements of the classic civilizations of ancient Greece and Rome was devastating and the transition from ancient to medieval art and architecture took place gradually. Architecture was heavily under the influence of the Catholic Church and Christian believes but they included some of the Roman achievements. One note though early in the eastern Byzantine Empire Justinian I (527-565) ordered the construction of one of the finest churches in Constantinople the Hagia Sophia, but in the Early Middle Age for most of western Europe it was more about mere survival. The migratory Germanic peoples possessed centuries of tradition in the decoration of practical objects, but none in the erection of permanent structures. The Germanic adoption of Roman architecture made little headway during this period very few buildings survive from the early Dark Ages, and those that did were generally significantly modified in later periods. 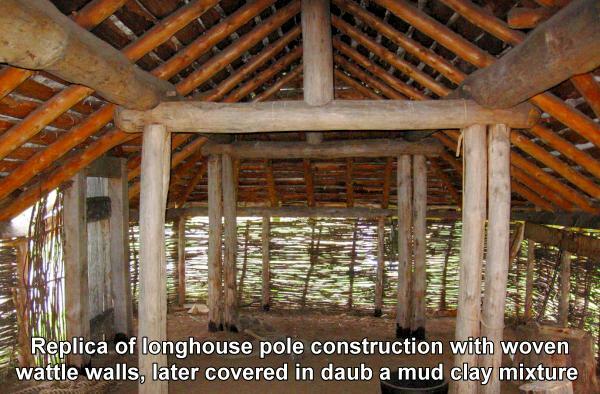 Most Anglo-Saxon buildings were constructed of wood with wattle and daub walls similar to Viking longhouses. Even the halls of nobles were simple, with a central fire and a hole in the roof to let the smoke escape rarely more than one floor, and one room. Heavy post and beam framing set directly into the ground, supporting the roof. Packed earth floors, though planks were sometimes used over shallow pits for storage. 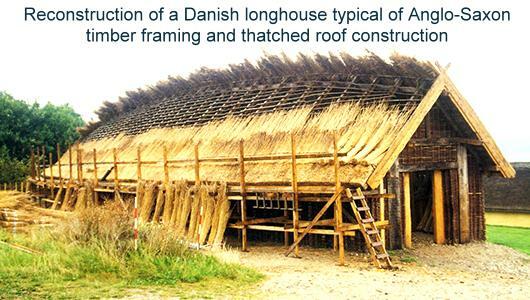 Thatched stick roofing being the most common, though turf and wooden shingles were also used. If there were windows they would have been covered with thin animal skins or wood shutters for defense.The only buildings they tended to build in stone were small scale churches with Celtic influences and very few decorative elements, typically from re-used Roman stone and brick. More defensive they put a lot of energy into tower building to gain a high lookout point for the villages and often these are the earliest surviving part of English parish churches. From 800 to 1100 the Vikings warriors from Denmark, Norway and Sweden were known for their naval power and as fierce fighters. 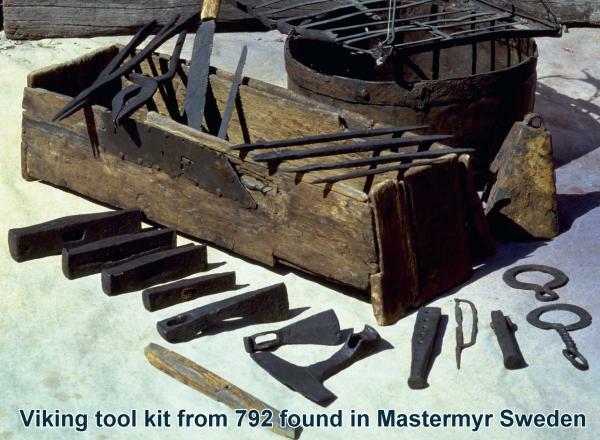 Their carpenters built ships that were perhaps the greatest technical achievement of the European dark ages. 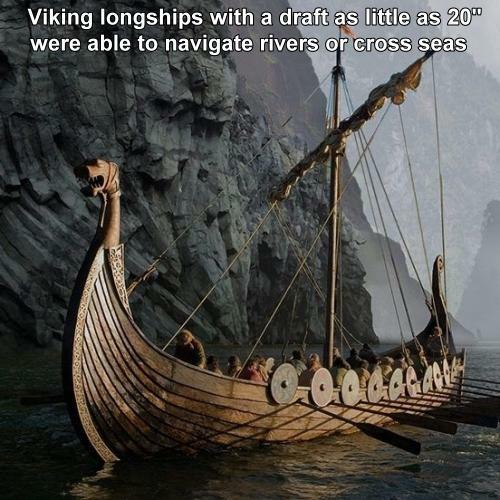 With the low draft longships some ventured out with swords and battle axes and raided along shorelines or up rivers and quickly returned to the sea, with little or no resistance. The Scandinavians had increased their trade and were aware that treasury was being stored at monasteries and churches, and these were their usual targets. The Norse were excellent craftsmen, explorers and believers in democracy who founded the world's oldest surviving parliament. For an unknown reason more were willing to venture to distant areas for the purpose of settling down. They ventured as far as Iceland, Greenland and North America 500 years before Columbus. The Viking chieftain Rollo raided Paris, and was granted by treaty an area of land at the mouth of the Seine in return for preventing other Vikings from attacking. Through consolidation of power and in time domnated what later became Normandy. They made settlements in Scotland, Ireland where they founded Dublin, and after 1066 with most turning to Christianity the raids ceased and the northmen assimilated. In 768 Charlemagne Charles the Great united the nobles in Gaul (France) and gave brief rise to the Carolingian Empire and foundation of the Holy Roman Empire. The revolutionary reforms under Charlemagne changed the craftsmanship of carpentry forever with the flowering of scholarship, literature, art, and architecture and the revival of religion and culture through the church. He gathered the leading intellectual lights of his age at his court in Aachen, which was a rise above when no one believed in change or progress. The surviving works of classical Latin were copied and preserved by Carolingian scholars and many of the monastic students went on to have a strong influence on medieval intellectual life. He standardized weights, measures, and coinage which fixed taxes from corrupt local tax collectors that had assigned a value through barter. He replaced amateurs in local courts with two itinerant (travelling) judges one for the church one for the state who had a better understanding of law which were now organized and some made into statutes for the empire. He changed Trial by Ordeal (where if you were a noble, you could prove your innocence by hiring someone to fight for you. If the person you hired lived, you were found innocent) to Trial by Jury. He standardized tolls and customs fees so that everyone paid the same price for the certain goods or services, which improved business. He reformed the clergy, to be ordained a priest one had to take an examination. Though split up upon his death, Charlemagne encouraged the formation of a common European identity, French and German monarchies considered their kingdoms to be descendants of his empire.